Disney Pixar Toy Story Wind-Up Slinky Dog Just $3.56! Down From $18.55! You are here: Home / Great Deals / Disney Pixar Toy Story Wind-Up Slinky Dog Just $3.56! Down From $18.55! 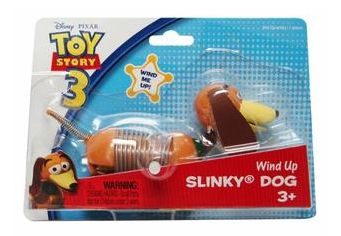 Sears has this Disney Pixar Toy Story Wind-Up Slinky Dog on sale for $3.56 (Reg. $18.55)! Slinky Dog has been a favorite childhood toy since the 1950s. Today, children recognize him from the widely popular “Toy Story” movies. Now your kids can have a fun, wind-up version of their favorite companion. Measuring approximately 4 inches long, this frisky pup walks across most flat surfaces after he is wound up. Wind-Up Slinky Dog makes a great party favor for Toy Story-themed birthday parties, or as a stocking stuffer or grab bag prize. This item has a metal-spring tail and a waist that resembles the original slinky. It is recommended for ages 3 and up.